Sunday, Aug 29 was my first church outing. 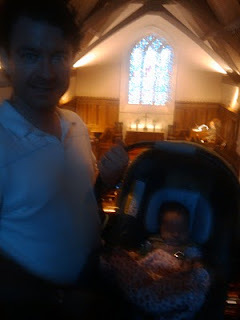 Mom and dad took me to Country Club Christian Church (where my friend Avery's parents were married) and they went to the 10am chapel service. I will say, listening to Dr. Miles soothing voice put me out for the hour. I guess mom and dad would call that "well behaved". We hung around for a bit afterwards for some meeting and greeting and ran into Doug Bates' dad. 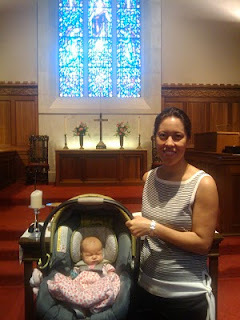 Maybe next time we'll meet up with Avery's grandparents (Chuck and Cheryl) who attend as well. Mom and dad mentioned something about an infant dedication on October 10th. Maybe that's when I'll get to drink the wine too? Almost forgot. They have cookies and Roasterie coffee every Sunday. Well guess what kind of cookies they had for the first time since mom and dad have been attending...Madelines. Coincidence? I think not. Someone must have known I was going to make my debut appearance. WWJD? Eat a Madeline of course.